Tickets are now available for Uncork Summer, Door County’s annual celebration of food, wine, and music in Ellison Bay. 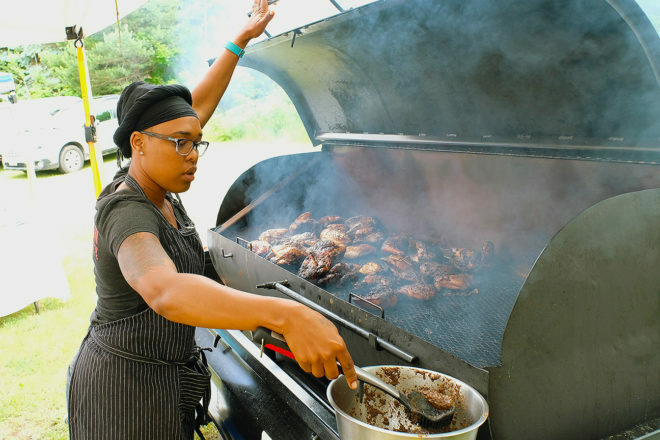 The festival returns to the grounds of the Wickman House June 23, with bites from more than 20 food vendors, plus wines, local ciders, craft beers, and hand-crafted cocktails. Jazz vocalist Erin Krebs and a surprise musical guest will entertain on the grounds as well. Tickets are now available online at DoorCountyTickets.com at special early-bird rates through April 15. Buy online and save $5 on day-of admission to the festival. On event day, tickets are available at the door for $10, plus food and beverage tickets for an additional $5 each. Food will be available from 11 am – 2 pm, with drinks and music till 4 pm. Ellison Bay Arts is extending gallery hours to 7 pm and the Liberty Grove Historical Society is extending museum hours until 5 pm. Free parking for Uncork Summer will be located at the Liberty Grove Historical Society property at the top of the Ellison Bay hill at the south end of the village. Free trolleys will bring visitors from the parking areas and to the Wickman House grounds. For complete event information visit uncorksummer.com or call 920.854.4450. Food, wine, and music festival featuring small bites from Door County chefs.